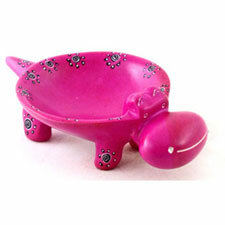 Our soapstone hippo ring dishes offer a sweet little place to keep your ring. Hand carved from soft soapstone by Gusii carvers in western Kenya, each hippo dish is dyed with non-toxic dyes by artisans in Nairobi. 4.5" x 2.5" x 1". Please choose from hot pink or turquoise.